Our task was to transcribe and, as far as possible, translate approximately two boxes (about 15 documents) containing legal charters and sasines written in Latin and dating from the fifteenth and sixteenth centuries, which had been given to the Heritage Hub in Hawick. Although a small group began the project, it soon whittled down to two of us: Christine Henderson who was in on the project from the start and has a background in Scottish history and in teaching history as a career, and Elizabeth Watson, who joined after the project began, and has a background in English sixteenth-century history and had some experience of reading the ‘secretary hand’ in which the documents were written. We met once a week to transcribe – and help each other with strange words and meanings – and we also sometimes put in some extra individual hours at home. It took us approximately 1½ - 2 years to transcribe the documents. Christine Henderson was at the same time working on a number of projects connected with Kelso local history with a group of other volunteers. The charters and sasines were of considerable historic interest, although not directly throwing light on the Battle of Flodden and its impact in Scotland. The documents largely relate to the family of Robert Douglas of Lochleven and their lands in Kinross and Perthshire. They include such gems as the burgh charter for Kinross. The documents would be a treasure trove for anyone researching the history of this important family, or that of Kinross and Perthshire more generally. They are also a treasure trove of early forms of placenames and of the names of farms and estates that have long since disappeared from the landscape. We very much hope that eventually our transcriptions and even our translations (both duly corrected by an expert hand) will be available, preferably online, to the relevant scholars. In personal terms - we derived a great deal of pleasure from the project. Most enjoyable was the weekly contact with a group of like-minded, knowledgeable and interesting people. We regularly sought each other’s opinion and gained knowledge far beyond what was needed for the project. Working on the documents was also very rewarding. Having not really used her Higher Latin for many years Christine found herself somewhat stretched, particularly by some of the unfamiliar legal terms. Elizabeth Watson’s ‘small Latin’ was considerably boosted by Christine’s superior expertise and in turn Christine received help from Elizabeth’s greater experience in reading the script of that period. Between us we made a pretty good team and achieved a greater familiarity with the vocabulary and finer points of medieval land law than either of us would ever have thought possible. How might we go on to reuse the skills we have acquired? Both Christine and Elizabeth are involved in many other local history projects. 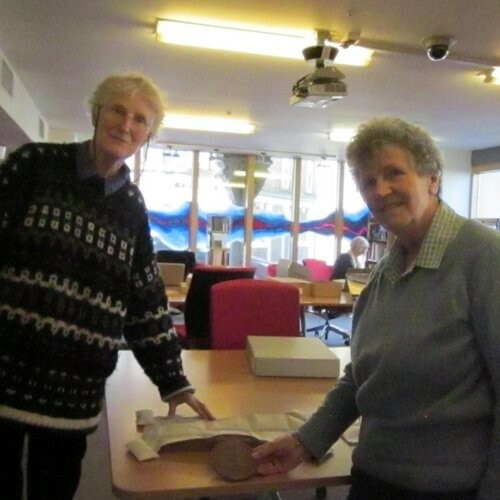 Christine already had a good knowledge of the Heritage Hub and how to use its resources, but the project has introduced Elizabeth to the Hub’s collections which she is now exploiting for other projects. She has also found in a group of volunteers investigating Kelso’s history who regularly meet at the Hub, a most useful and congenial group of local history experts who can give much practical information and advice. In relation specifically to the charters and sasines that we transcribed, Christine has been able to draw the documents to the attention of a notable scholar of placenames (Dr Simon Taylor) with whom she is acquainted.